Have you ever wanted a stronger faith--the kind that spills out and changes the world around you? A faith that stands strong under any trial or pressure? This kind of faith isn't just for superstar Christians--it's for all of us. The secret is to fully engage our minds, not just our hearts. Dynamic faith means knowing why you believe what you do about all matters of faith, especially the Bible, God, Jesus, and Salvation. In this woman-to-woman book, Patty uses real-life stories and examples, including her own experience coming to Christ after a ten-year search for truth. She reveals how beliefs play an active role in behavior, in relationships, and in families, and she demonstrates how you can share and defend your faith to those you love in a compassionate, relational way. Loving God with your heart and mind is the next step to the faith you've always wanted. Let this book show you how to get there. Patty Houser (MA, Christian Apologetics, Biola University) is the director of women's ministries for Solid Reasons and is a national conference speaker and teacher who equips women to share and defend their faith in language women best understand: woman to woman. She lives with her husband and son in Burke, Virginia. 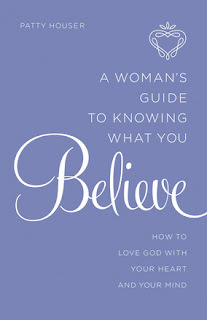 A Woman’s Guide to Knowing What You Believe is a wonderful book to help you love God with your heart and your mind. With this book you will also grow your faith and really understand how to communicate with non-believers. This would be a terrific book for a women's small group or study group. The discussion questions at the end of each chapter really help you to dive even further into what you believe and help to strengthen your faith. I highly recommend A Woman’s Guide to Knowing What You Believe! You can find A Woman's Guide to Knowing What You Believe by Patty Houser on Amazon, Barnes and Noble and other bookstores.